Today, a major modern history of British and Irish fairies is officially published. The book Magical Folk: British and Irish Fairies – 500 AD to the Present is by Dr Simon Young and Dr Ceri Houlbrook, who conducted a survey on modern fairy beliefs. Dr Simon Young, lead scholar of Magical Folk: British and Irish Fairies – 500 AD to the Present, concluded as part of the research the first scholarly online fairy survey over four years that British people's belief in fairies is increasing. Only four per cent said they did not believe in fairies, while 44 per cent of the respondents said they had actually seen fairies. Twenty-three per cent they had seen a fairy once, 57 per cent saw them occasionally and 20 per cent saw them regularly. The rising number of sightings correlates with the popularity of films about myths and the supernatural such as The Lord of the Rings (based by JRR Tolkien on a Worcestershire fairy recorded as being seen near his aunt's house). The online questionnaires included detailed questions about the geographical, social and religious background of the respondents as well as their actual experiences. Dr Simon Young and Dr Ceri Houlbrook (Fellow at Hertfordshire University) were supported by a team of leading folklore and history researchers from the Universities of Chichester, Bristol, Cardiff, Cork, Dublin, the Folklore Society and Bourne Hall Museum. All of those who provided detailed descriptions of their sighting of British and Irish Fairies also added geographical locations where they saw (or continue to see fairies). 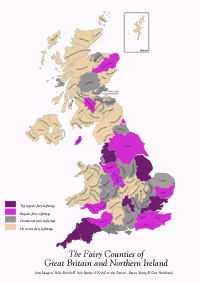 This data allowed Dr Simon Young to draw up the first fairy map for Britain. The map of sightings by respondents addresses at least one previously unanswerable question – where in Britain one is most likely to encounter fairies and where fairy researchers are most likely to encounter people who see fairies. Overall, 80 per cent of people saw fairies once or occasionally, which suggests that a special sensory talent is not necessary to come across British or Irish fairies. Britain's top fairy towns are London (more than 50 per cent of regular city sightings), Birmingham, Bath, Glasgow and Aberdeen. British fairies are not necessarily nice tutu-wearing butterfly-sized creatures. Respondents who encountered British and Irish fairies reported that they were angry (particularly in Essex and Scotland) and mischievous. Some respondents reported that their encounters were sexually and erotically charged (especially in Essex, Hampshire and Somerset). Fairy sizes varied from leaf-size to 15ft giants.